So we started to plot and to scheme, to devise plans to get him down to Santa Barbara for a chat with some of these fans and admirers. Through many months of schedule conflicts and planning and thought, Wes Hagen, of Clos Pepe, has been absolutely dedicated to bringing Randall down to Santa Barbara County. For those of you who know Wes and what he does at Clos Pepe you will know it is a natural fit, a strong pairing of philosophy and style. Wes is one of the clearest voices in the Sta. Rita Hills. So, on May 11th, for 50 lucky people, the two great minds (and wines) will meet for an event we are calling Doon on the Clos. 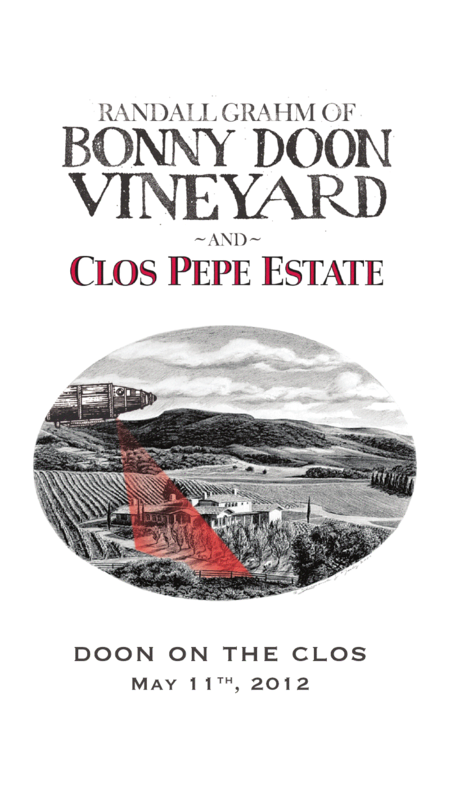 Tickets are available at Clos Pepe’s site for $75 each and will include two bottles, a 2007 Le Cigare Volant from Bonny Doon, and either a Clos Pepe 2010 Barrel Fermented Chardonnay or Axis Mundi Grenache/Syrah. Light food will be provided and ample conversation, after all, this is Randall Grahm and Wes Hagen. On behalf of Damaris and I, thank you Randall and Wes for being committed to this and allowing us to play our small roll. You are both an inspiration to us and our work. See you all Doon on the Clos! Nice! Congratulations on what is sure to be a great event! Thank you Tracey! It should be a lot of fun. It’s fun to bring people together, as you well know. Steve Pepe will be firing pizzas in the oven–bread and cheese, earlier in the day we’re going to play disc golf at the private course at the Clos. Wes, the pizzas are always great! I have never played disc golf. This should be pretty epic! Another play date I shall miss. NOOO! I have a wedding that weekend in San Francisco! Sounds so good though.